Aromatherapy can be beneficial with precautions. You can create your own blends. The ideal way is to muscle test first to see if it would be beneficial for your pet. Then if you get a strong response, muscle test to find out what 4 therapeutic grade oils from that particular blend’s options will create the right blend for your pet. Place 2 drops of each oil in a 4 oz. spray bottle then add water. Essential Oils can be a very powerful healing option for both physical and emotional issues if tested and used correctly. If you are wondering if aromatherapy could be the best fit for you and/or your pet here are some things to consider: Are there any emotional issues? Anxiety, nervousness, stress or hormone related issues. Are there any physical issues? circulatory problems, digestive problems, joint conditions, parasites, and skin issues. The science to getting essential oils to work is one that is easy for any person to do and a health remedy dating back all the way to the 18th century. Just like with people, the essential oil or hydrosol is inhaled by the animal or rubbed into their skin. When the animal’s nose senses the oil, the molecules of the oil are sent as electrical impulses which are processed in the part of their brain where memories and emotions are stored. Because of this, the animal’s body releases chemicals such as serotonin, which has a calming effect, noradrenaline, which stimulates and rejuvenates, and endorphins, which help relieve pain. After the molecules are processed by the brain, they enter the bloodstream and make their way throughout the animal’s body. If the oils are rubbed in, the molecules are absorbed through the skin and enter the bloodstream that way. Aromatherapy has changed many people and animals lives for the best and turned aggression in to bliss. Some may not grasp the concept of aromatherapy or believe if it works or not, but chances are that in some point in your life you have already used aromatherapy. Think about your favorite scent and why it is your favorite. Does it trigger a happy memory or place for you? If you answered yes then you have already experienced the comfort that aromatherapy can bring to you and your pet’s life. 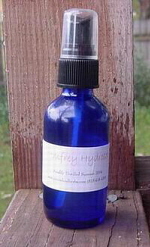 You may purchase Aromatherapy blends through The Lightfoot Way or through Earth Angels Oils. Calm your pets with lavender, clary sage, ylang ylang, green mandarin, sweet majoram, Roman chamomile or sweet orange. Pests like mosquitoes, flies and fleas may be repelled by lemon, lemongrass, grapefruit, peppermint, citronella, eucalyptus, cedarwood or clary sage. Motion sickness may be alleviated with 4 drops each of ginger and peppermint.